Ok guys let me clear this upfront. I haven’t tested this method yet, but by the looks of it, there is no reason why it shouldn’t work. 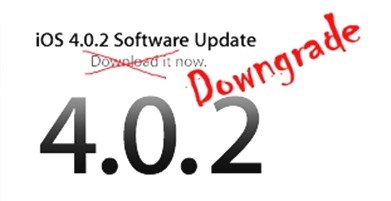 If you have just got a new iPhone 4 or iPhone 3GS (new bootrom) which is on iOS 4.0.2, you can now downgrade to iOS 4.0.1 without having your SHSH blobs saved. This will of course allow you to jailbreak and unlock your new iPhone with JailbreakMe, and patch it with PDF Patch so that you are safe from PDF vulnerability in iOS 4.0.1. Today I found something that the iPhone Devs told me "impossible". I also spoke with iH8Snow, telling me that this sounds impossible. He also mentioned to me and one of my beta testers that this is possible if you allowed Cydia to store your SHSH/Blobs since Cydia will cache your firmware along the way. Well, I’m pretty sure I proved them wrong. So the story is that I have possession of clean (never before jailbroken) iDevices, and I managed to downgrade one of them and upgrade one of them to iOS 4.0. The step by step instructions for downgrading new iPhone 4 and iPhone 3GS without having SHSH blobs saved are posted below. Follow them at your own risk. I am not responsible for any loss of data, or malfunction of your iPhone. Step 1: Download iOS 4.0.1 ipsw from here. Step 2: Extract it with WinRAR or WinZip to a folder on the desktop. You may need to rename the firmware file from .ipsw to .zip to do this. 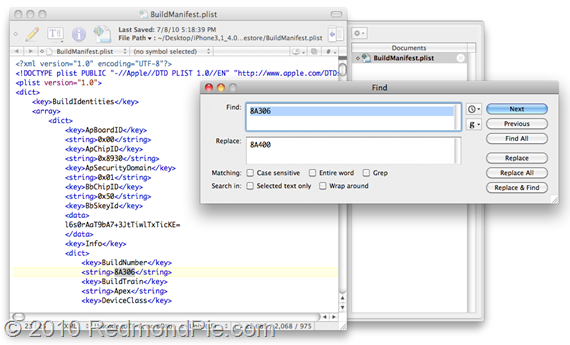 Step 3: Open the buildmanifest.plist with the Notepad if you are on Windows, or TextWrangler if you are on Mac. Search and replace all – 8A306 with 8A400. Save. Repeat the same with the file restore.plist. Step 4: Download iOS 4.0.2 ipsw from here and open this with WinRAR or WinZip. Note: Do not extract it. Just open it and leave it open. You must use this exact file and not create a new one. If you have to create a new one for reasons like you are on OS X, then use zip command line not explorer or finder to make the zip. I will assume you are using the original file opened in WinRAR for the rest of this guide. Step 5: Take all the files from iOS 4.0.1 and drag them over to the iOS 4.0.2 zip archive that you have open. Step 6: Delete all the .dmg files that have 002 at the end, leaving only the 001 files left. Step 7: Save the archive, and rename it back to .ipsw if you changed the name to get WinRAR/WinZip to open it. Step 8: Optional (This helps ensure you get an SHSH file request for the future, but should not be necessary to just restore iOS 4.0.1). Add the 74.208.10.249 gs.apple.com line to the host file. If you need help with this step, read Step 3 from here. Step 10: Now simply open iTunes and restore the firmware you changed. UPDATE 1: Ok guys, I know I took a little long to provide this update but this was because I was thoroughly testing this method to see if it really works. After trying it out on my iPhone 4, 3GS, iPod touch and iPad, I can confirm that this at least didn’t worked for me. But then again I got lots of messages from Twitter and email from users who said that they got it working on iPhone 3GS and all. But at least in all my tests, it didn’t work for me even on an iPhone 3GS. 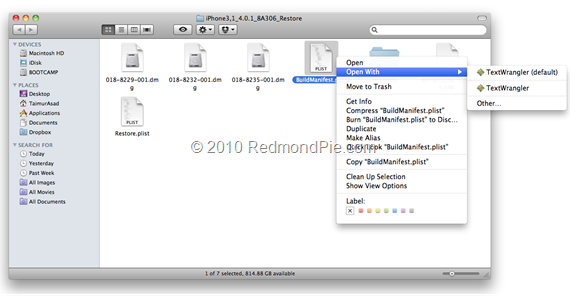 There is much discussion on many blogs about a potential means of downgrading iOS 4.0.2 to 4.0.1 by simply changing a couple values in the buildmanifest.plist and copying all of the images from 4.0.1 into 4.0.2 and then deleting the files ending with 002. Following all of this, perform a DFU restore and somehow you will be on 4.0.1. There is a perfectly logical explanation for all of this and I will lay out exactly what is happening and explain why it is working for the folks that are the lucky ones. Let me get this out first. There is NO way around this… unfortunately this method included. Let me start by explaining something very important. The buildmanifest is used by iTunes to build much of the TSS request that is used to obtain your SHSH for any given firmware revision. Unfortunately, the BuildNumber has no part to play in the request for SHSH. All that you ended up doing in following these directions is request 4.0.1 SHSH blobs.THAT IS ALL. Since every single one of you that got this to work changed your hosts file to point to Cydia, Cydia responded to the TSS request with an SHSH blob that was ALREADY "on-file". There was no magic. There was no miracle, apart from the lucky break that your device had been put on Cydia’s SHSH request list at some time in the distant past. So yes, unfortunately, the wait continues..
‘This device has a pending TSS request’. And like i said, it was a Brand New 3GS, Opened by me last night. I used iTunes 9.0.2.25, I will upload my modified file after work this evening. I tried in iPhone 4. Don´t work, i´ve got the same 3194 error. If you cannot get this to work your doing something wrong, I Really Did Just get my iPhone 3GS 8GB in the Mail from at&t yesterday on Version 4.0.2 and I followed this guide to the T and I used 7zip like ShortZi recommended above when opening the 4.0.2 to delete the 02 DMZ’s and My Phone is on 4.0.1 VERIFIED!!!! Actually my method is simple, download/save the iOS you want to downgrade to, shift click restore in iTunes, select the iOS and it restores the phone to that iOS. Works every time for me, and I’ve done it loads. i have tried it in my iphone4 and it didn’t work with me even though i have followed the tutorial step by step with and without changing the host file and i i can say for sure without a saved SHSH file on saurik server it’s just a waist of time. I tried but error 1604. I guess there is no one who succeeded downgrade operation. sorry admin when do u think there will be a jailbreak and unlock for the iphone 3gs on 4.0.2?? Where should one save the modified 4.0.2 file in order to restore from? I have it on my desktop, however after putting my 3GS into DFU mode, when I began the restore process in itunes, it began downloading the new file from another location. Will wait and see what happens once the download completes. it works for 3GS or not ? Glad you got it working also, i dont know why everyone is having problems, it definitely works! I downgraded yet another 3GS (old boot rom) from 4.0.2 to 4.0.1 which never ever had SHSH blobs saved or jailbroken before. Interesting thing is that, I saved 4.0.2 blobs locally and to Cydia using TinyUmbrella and then queried for 4.0.1 and got a success return from Cydia. I then started TSS locally to downgrade using official firmware. it worked for me. I downgraded iphone 3gs from 4.0.2 to 4.0.1. However it only worked when I read the post from codeblue where he said to leave the file in C:documentandsettings/user/application data/apple computer/itunes/iphone software updates. It did not work when I pressed the left shift key and pointed the restore to the file. So if the only blobs I have saved on Cydia are from 4.0 I can upgrade to 4.0.2 and than use this method and it will work? Thanks in advance. “the iphone coul not be restore because the firmware is incompatible” – this is what said to me ! pls help !! accidently had to upgrade my 3gs 32gb to 402. used tinyumb to save blobs. i get error 3014…wht do i do?! Hey I tried that, New iphone purchased today with 4.0.2 on it. Any more details? Did you have TInyumbrella running already, did you put into DFU mode first etc. I donwgraded a 3Gs 16Gb Iphone that it was blocked , the only way it was restoring the iphone to IOS 4.0.2 from itunes, and then , I followed all the steps above, the iphone never was jailbreaked before, and it works!!! , I downgraded from 4.0.2 to 4.0.1 , without problems….now I have my Iphone jailbreaked from jailbreakme.com from safari , and unlock with ultrasnow from cydia…. Can you post a link to download the file you used? Hey man could you please upload step-by-step video of this. I dont get how to do this and i recently got the iphone 4. you could email me at asifjaleel@gmail.com. even a step-by-step in detail in text would help. Im a newbie could use some serious help. thanks! Same here just bought my iPhone 4 and it came already upgraded to 4.0.2 🙁 anyone have a working downgrade?